In a blatant rip-off of The Truth About Cars "Curbside Classics" feature, I'm going to call my own little doomed feature; "Curbside Columbus". Or maybe I should just go with Columbus Curbside Classic? Whatever. The cars I find and post here will rarely be classics anyway. First feature ever? 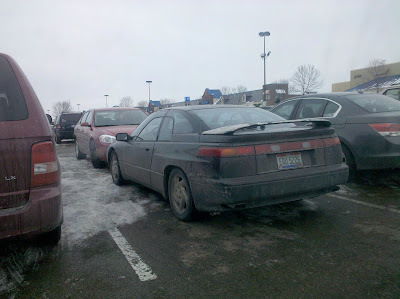 The Subaru SVX. I found this little gem out in Pickerington. I didn't know anything about the car before I looked it up afterwards. 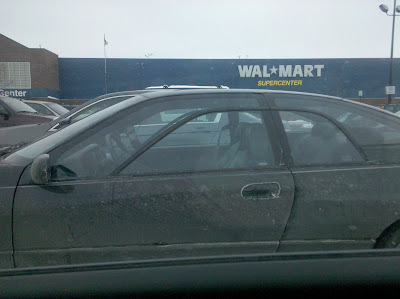 Turns out it is a moderately rare car. The windows were the first thing that caught my attention. Pretty neat car. NEAT. I don't have any special tid-bits to ad because I've never seen one before or really even heard about it. I found out that it didn't sell that many cars but does have a pretty enthusiastic following. Look it up if you get a chance. Good looking car.